When John Zatara, the Golden Age magician who performed spells by reciting them backwards, and who may have first appeared in Action Comics #1, making his debut alongside the GA Superman, was first created back in the day, who would’ve thought that he’d end up leading to the creation of one of comicdom’s hottest women next to the Black Canary, since she too wore fishnets, and coupled with her macigian’s tuxedo and top hat, she was simply a knockout. She was Zatara’s daughter, born of both him and his wife, Sindella, another decendant of a community of mages. She hadn’t known initially that he was as much an actual expert in magic as he was in showbusiness, but when she learned that he had gone missing for reasons not clear to her, she set out to find and rescue him. And in the handful of issues of five different books where she made appearances, including one where it was revealed in retrospective that she’d been there, her adventures with Hawkman and Hawkwoman, Batman, Atom, Green Lantern and Elongated Man, and all wrapped up in Justice League of America with all of the above involved, it was simply one of the most charming tales of the Silver Age. Her first appearance was in Hawkman #4 in 1964, when she’d accidentally split herself into two parts and paralyzed herself, since, at the time, she wasn’t fully experienced with her father’s art of magic, and to obtain help, she managed to get two ancient artifacts to turn up in Katar Hol’s museum in Midway City, where he and then wife Shayera Thal lived and worked. It was a simple, but still very exciting introduction, explaining what she was trying to do at the time. Soon afterwards, she would turn up, in disguise, in Detective Comics, in a story in which Batman and Robin investigated thieves who were using a witch to back them up on a robbery (and it turned out that the Outsider was controlling the disguised-as-witch Zatanna to force her to back up the job, and to put a stop to his nonsense, she put a thought into Robin’s head on how to help), the Atom, in which the Tiny Titan helped the Magic Maid to enter a magical realm through a book to combat the Druid, another adversary of her father’s, Green Lantern, where she and the Emerald Gladiator entered another magical dimension to face the Warlock, who wanted to exit the land in order to conquer earth, and again Detective Comics, in one of Elongated Man’s backup stories of the time, in which the Stretchable Sleuth helped to deal with a pair of crooks and a crooked prop shop owner who used his business to fence stolen goods. 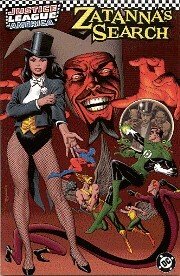 And the search came to its marvelous conclusion in Justice League of America, where all of the above, save Hawkwoman, met with Zatanna at the League’s HQ to hear the story of how Zatanna Zatara was able to conjure up special doubles of themselves to help out in final showdown to defeat a villianess who’d put a curse upon her father in the first place, the reason why he’d ended up splitting in the first place, on a magical plane where he was currently residing. It’s a most charming compilation of some of the best stories of the 1960’s, all written by Gardner Fox at his best, and introducing a girl who, while she’s never had an ongoing series of her own, has still become a cult favorite in the DCU today. And the artwork, by some of DC’s best lineup of pencilers, is still very colorful by today’s standards. The last story in the TPB is a backup story from DC’s Blue Ribbon Digest from 1980, written by Gerry Conway, which tells the origins of Zatara, how he inherited from his grandfather’s legacy in the world of entertainment, learned that to be a success he needed an understanding of style and grace upon the stage, and how he discovered his ability to perform magic spells by reciting them backwards, which led to his own career in crimefighting. It’s a very touching ending to the compilation, and conveys the spirit of adventure very well. Most interesting of all, however, is how it all fits in pretty well with continuity as done post-Crisis on Infinite Earths. Zatanna’s Search is an excellent introduction to one of the most appealing ladies in comics, and how she followed in the footsteps of her famous father. Copyright 2004 Avi Green. All rights reserved.